The Montiel Park Disc Golf Course is a 9-hole course designed for use by beginning and experienced players alike. The course officially opened to the public on February 27, 2008 with the 1st Annual San Marcos Ice Bowl Tournament. The course was added as the second phase of development for Montiel Park, in the City of San Marcos, California. Funding for landscaping, disc golf baskets, benches and trash cans was provided by the City of San Marcos, while the course's tee signs were purchased using funds donated by local businesses and organizations. Holes in the standard 9-hole layout range from 129 to 354 feet in length, with as much as a 30 foot change in elevation on some holes. There are nine alternate tees ranging in length from 230 to 450 feet which allow for a unique 18-hole layout. Our friendly Monday @ 5pm doubles matches end late in October, but will be replaced by the Fall/Winter weekend doubles series, which will be held Saturday mornings at 10am. All comers are welcome (as long as you have $5 to ante up). 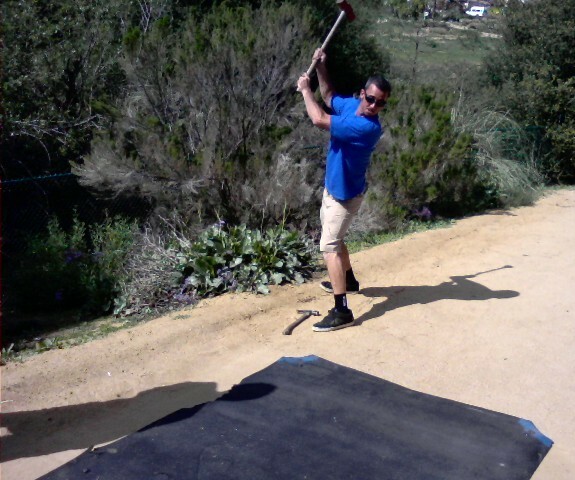 Activities at Montiel Park DGC are organized by the San Diego Aces Disc Golf Club. The course representative for Montiel Park is Allen Risley. June 15, 2010: 3rd Annual Montiel Ace Race scheduled for September - Montiel Park will host its 3rd Annual Discraft Ace Race Tournament Sunday Sept. 12th at 10am. Entry fee is $25, pre-registration is recommended as the field will be capped. In an ace race tournament, players play 36 holes of tee shots only, recording aces and metal hits from their tee shots. The winner is the player who records the most aces with ties being broken by metal hits. Each player receives two new prototype Discraft discs, a Discraft hat and a mini (a $55 value). 1st prize for the Ace Race is a new Discraft golf bag filled with premium-plastic Discraft discs. Check out Mike Allee's bag - he was last year's winner! February 15, 2010: Ice Bowl Wrap-up - Many thanks to all who played and helped out with the 3rd Annual San Marcos Ice Bowl on Saturday. We had very un-icy weather, with a high of 75 degrees and sunny skies all day. We surpassed our fundraising goal this year, collecting over $1,100 and a few hundred pounds of canned food for The Angel's Depot - good going, disc golfers! Danny Z also took away the prize for the most canned food donated, so he had a pretty good day. Josh U'ren continued his winning Ice Bowl ways - last year he won the Innova basket for getting an ace, this year he won Disc Golf Bingo. And the winner of the prize for the lowest PDGA number in attendance was not #100 John Kirkland - though he was sure it would be - but instead Scott Dickson took the prize with PDGA #84. Monica Watkins, co-TD and logistician extraordinaire; Brian Bobka, for helping all day long in many ways; Michelle Chambless, Ben Rutherford and Michael Shaw, for helping out with player check-in; Nick Newton, for helping us transport all of the tables and chairs to and from Jack's Pond Park; A.J. Risley, for running the putting contest and providing a few "special" prizes; Nate Carter, for supplying the sound system; and Ryan Meyer, for helping with check-in, scorekeeping and schleping tables and chairs back to Jack's Pond. Thanks to each of you for giving up your time the day before, energy, warm-up time, wind-down time, etc. to make this tournament a success! December 10, 2009: It's that time of year again - time to prepare for the Ice Bowl!!! - Team Rizbee Productions will be hosting the 3rd Annual San Marcos Ice Bowl on Saturday, Feb. 13th, 10am tee-off. Last year's San Marcos Ice Bowl was the event that propelled Nikko Locastro to his win at the USDGC - will it do the same for you this year? As with previous years, this Ice Bowl will raise funds and collect canned food for The Angel's Depot, a food bank for senior citizens that serves North County. We will also once again be one of the stops on the Golden Sombrero Tour, a 4-event tour where the winner receives a portable basket. I'm still working on details and will have a flyer available soon, both in paper form at Montiel Park and online. I'm looking for ideas on how we can keep players from going hungry and thirsty throughout the day...any ideas? Keep watching this space for more details. And if you'd like to help out with Team Rizbee, please contact me! August 10, 2009: Labor Day event scheduled for Montiel - Montiel Park will be the site for disc golf fun on Labor Day (Monday, Sept. 7, 2009). The San Diego Aces will be holding a fundraiser for the new disc golf course on the campus of Cal State University San Marcos. Proceeds from the sale of "World's Biggest Disc Golf Weekend" discs and tie-dyed t-shirts will go towards establishment of San Marcos' third disc golf course (and our first 18-holer). Purchase of a disc and t-shirt player pack ($25) will include entry in the "WBDGW One-Disc Challenge," an 18-hole tournament where players must use a 2009 WBDGW disc. You can see the flyer for the labor Day event here. Print out this pre-registration form and send it in. The Aces have signed on as a major sponsor for the CSUSM course and will be holding a series of tournaments and events to raise $2,500 towards the purchase of baskets, tee signs, etc. For more information call Allen Risley at 760-798-2080 or e-mail rizbee@teamrizbee.com. March 12, 2009: Long pads getting upgraded - After a bit of waiting we are finally working on installing the rubber mat pads on the long tees for holes 2, 3, 4, 5, 6 & 7. A big thanks to Reese Swinea of Fly18 Disc Golf for his donation of some "gently used" pads from one of his other courses. This donation will allow us to apply some of the tee pad fund dollars towards other improvement projects on the course at Montiel Park. 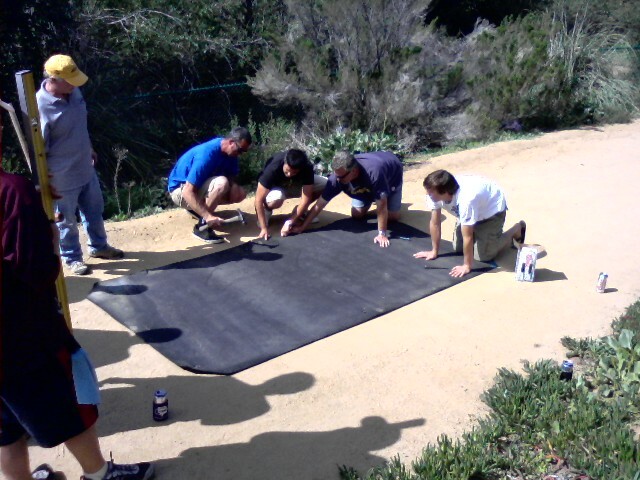 On Saturday, March 7th, after the YDGA clinic (described below) a group of about a dozen volunteers pitched in to help two install back pads for Hole #2 and one pad for Hole #6. A.J. Risley christened the long pad on #2 with a TeeRex hyzer tee shot that landed right under the basket. The work party was held after a youth clinic was held, organized by the new Youth Disc Golf Association. Two scout troops showed up to learn the finer points of disc golf, and were treated to some instruction and then a tour around the Montiel Park course. It was a great event and hopefully the first of many to come. February 22, 2009: Clark Bartram video - Clark Bartram shot this video at Montiel Park last weekend, edited it and put it up on his web site: www.clarkbartram.com. He shot it during our regular Saturday morning doubles tournament. Seth Rushin is interviewed at the start, with a few comments from Dennis Keane later on. Several players are included in the action shots, which include a thumber near-ace of Hole #7. BTW, thanks to Dennis for taking on the responsibility of running doubles on Saturday! - $1 mulligans sold to benefit The Angel's Depot - mulligans are also raffle tickets!! Over 30 raffle prizes so far!!! 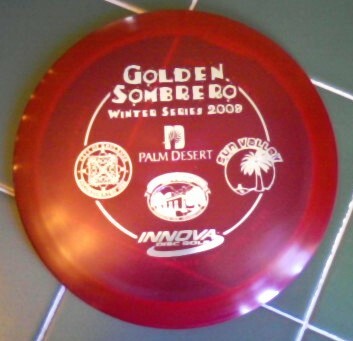 The Golden Sombrero Series is made up of four Ice Bowls: Redlands on Jan. 3rd, Palm Desert on Jan. 10th, San Marcos on Jan. 17th and Sun Valley on Feb. 28th. All four tournaments are raising funds for local food banks or shelters - great charity causes. Players participating in the series will collect points at each event, based on the number of players of their gender that they beat. The respective male and female participants with the most points after the Sun Valley Ice Bowl will receive the coveted Golden Sombrero awards, which are guaranteed to be cool to look at and a good way to shade yourself from the sun. The overall winner will also receive an Innova Discatcher Traveller portable basket!!!!!!! The entry form is available on this site - go to the Ice Bowl link in the navigation bar. Send it in early to secure your spot. Contact Allen Risley at rizbee@teamrizbee.com or 760-798-2080 if you have questions. October5, 2008: Ace Race Wrap-up - The Discraft Ace Race at Montiel Park was a great success! Forty-three players came out to help the San Diego Aces raise funds to pay for rubber tee mats for the alternate tees at the course. Over $400 was raised, which should be enough to add rubber pads to the six holes that need them. Jeremiah Price was the hot hand of the day, recording two aces during one of his 9-hole trips around the modified Montiel layout, good enough to win a brand new golf bag and 10 discs from Discraft. Ben Rutherford had the first ace of the day, which was good enough to hold on for a tie for second place with Danny Zwolenski, who also had one ace and one metal hit. Max Rumbaugh also recorded an ace to come in fourth. Montiel regular Don Vincent walked away with the Mini Ace Race title - his one ace and one metal hit barely enough to beat Allison Wylot for the title and $36 mini ace pot. Full results can be found on the Results page. There are also lots of pictures of the Ace Race festivities on the Photo Gallery page. All players walked away with two brand new Flex-ESP discs, a cool full-color mini and a Discraft Hat - a $55 value for their $25 entry fee. Many thanks to the registration crew (Monica, Curtis, Brian and Katie), Emerald Isle for prizes, players who brought mini baskets and Discraft for all they provided. Have you ever slipped and screwed up a tee shot on the back tees for #2, #3, #4, #5, #6 or #7? Well, this tournament is being held to raise funds for rubber tee mats for the back tees at Montiel. Ten players are needed to pay for a tee pad (but the first ten help pay for park insurance...). The more players we get, the more tee pads we can buy! Discraft handles the grand prize, but Emerald Isle will be providing prizes for the first ace turned in on a scorecard and the 2nd-highest number of Aces or metal hits. There will also be a few CTP's on some of the longer holes. We will have a mini-golf course set up - a Mini-Ace Race, if you will. It will cost $1 to play, with the rules just like the Ace Race - aces and metal hits only counted. You can enter and play as many times as you like. The proceeds will be split 50-50 between first place and the tee pad fund. Mini-Disc Golf World Champion Carl "Beanieman" Renda will be on hand to challenge all comers. Can you beat the World Champ? Finally, there will be an Ace Pot at the Ace Race. Players can buy one share of the Ace Pot for $1 - you can buy as many shares as you want, but you must buy them before you start your first nine holes. Each person in the pot who has an ace will get a portion of the pot, based on the number of shares they have purchased and their number of aces. 25% of the pot will go into the tee pad fund. Our first Ace Race in San Diego County, possibly in SoCal!!!!! August 12, 2008: Montiel Ace Race is a go - Montiel Park will host a Discraft Ace Race Tournament Sunday Oct. 5th at 10am. Entry fee is $25, pre-registration is recommended as the field will be capped. In an ace race tournament, players play 36 holes of tee shots only, recording aces and metal hits from their tee shots. The winner is the player who records the most aces with ties being broken by metal hits. Each player receives two new prototype Discraft discs, a Discraft hat and a mini (a $55 value). The flyer for the tournament is available here.